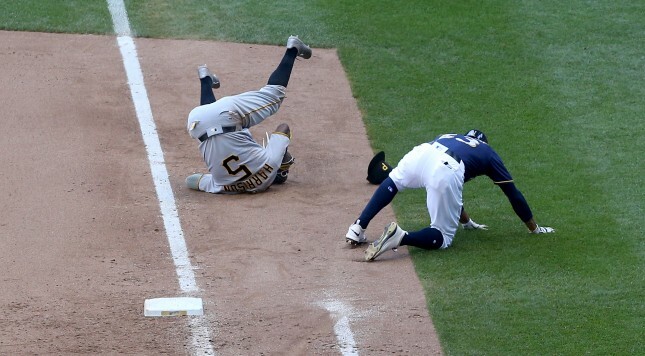 Pirates swept at Miller Park. Again. | Where Have You Gone Andy Van Slyke? Here’s the thing about an easy schedule: it doesn’t do much good if you don’t beat the bad teams that make the schedule easy. The Pirates went into Miller Park this weekend playing relatively good baseball, then scored six times in three games in being swept at Miller Park for the ten millionth time in the 16 year history of the stadium. It is pretty tempting to complain about the way that Clint Hurdle employed his bullpen this weekend, as he let both Steven Brault on Friday and Francisco Liriano today bat with runners on base in a close-and-low-scoring game despite being mostly out of gas, only to make an out and give up another run in the next inning. It’s tempting to do that, but the issue this weekend was really the offense. The offense spent most of the weekend watching third strikes, then turning around to complain to the umpire about them. This strategy remained ineffective all weekend, though the Pirates valiantly refused to deviate from it. Occasionally, Gregory Polanco hit a solo home run. It was excruciating to watch. Because of the way the Cardinals and Marlins traded wins this weekend, the Pirates only lost two games in the standings and remain four games behind the Marlins for the second wild card spot. They are going to have to be much less pathetic in the immediate future for that to matter much longer. In related news, the trade deadline is tomorrow and if the Pirates don’t do anything, they’ve apparently planned to start both Jeff Locke and Ryan Vogelsong in Atlanta next week.